By the light, of the silvery moon... We'll be cuddlin' soon, By the silvery moon. So run the lyrics to a popular song published in 1909. Back then, electricity was still relatively new-fangled: Thomas Edison had opened America's first proper power plant, in Pearl Street, New York City, only 27 years earlier. These days, thanks largely to Edison's promotion of electricity as a super-convenient power source, things have moved on. Now we're much more likely to cuddle by the light of the "silvery" tungsten. Until low-energy fluorescent lamps started to become popular, most electric lights were incandescent: they worked by making a tight coil of wire so hot that it glowed with white light. The wire had to be super-tough to survive high temperatures so it was made from tungsten, which has the highest melting point of all metals. Lighting homes is only one of the things that tough-old tungsten is good for. You'll also find it strengthening drills and airplane parts. Let's take a closer look at this intriguing element and find out some more! Photo: The glowing white line is the filament of an old-style incandescent lamp. Really, it's just a very tight coil of thin wire. When electricity passes through the filament, its high resistance produces so much heat that it gives off light as well. Tungsten has proved to be the best metal for surviving such tough treatment over hundreds of hours of use. It's very hard to take photos like this without risking damage to your camera—if you're trying it yourself, use a very short exposure. Tungsten is a silvery-white, hard and strong metal that lives in group 6 (VIb) of the Periodic Table. Like chromium, copper, and iron, it's a transition metal (also called a transition element). In continental Europe, tungsten is often referred to by the alternative name of wolfram. Several hundred years ago, German smelters decided this was a good name because tungsten reacted voraciously with tin-rich oxides "like a wolf." That's why its chemical symbol is W and not T or Tu. 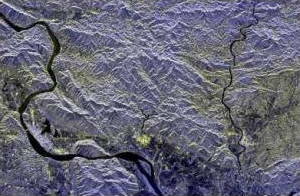 Photo: Mineral rich: A space radar photo of the area around the Chinese city of Zhao Qing (light blue area along the banks of the River Xi Jiang, lower left), one of China's most important mineral-producing regions, rich in tungsten, lead, zinc and gold. This photo was taken by the Spaceborne Imaging Radar-C/X-Band Synthetic Aperture Radar (SIR-C/X-SAR) onboard the Space Shuttle Endeavour on April 17, 1994. Courtesy of NASA Jet Propulsion Laboratory (NASA-JPL). Tungsten is moderately common in Earth's crust: it's the 57th most common chemical element out of the 92 that are found in nature—so roughly in the middle of the list. In practice, you'd need to dig up up about 1.5 tonnes of rock to get about 1 gram (0.04 ounces) of tungsten, so you can see mining the stuff is pretty hard work! What makes it harder is that tungsten doesn't occur naturally in its pure state but only combined with other metals, mostly in two minerals called scheelite (a compound of calcium, tungsten, and oxygen with the chemical formula CaWO4) and wolframite (an intermediate compound that includes either iron or manganese plus tungsten and oxygen). The minerals are reacted with sodium carbonate or sodium hydroxide to produce sodium tungstate. The sodium tungstate is washed with water and reacted with hydrochloric acid to make tungstic acid (H2WO4). The tungstic acid is washed and dried to produce tungsten trioxide (WO3). A metric tonne of tungsten trioxide contains about 8kg of tungsten. The tungsten trioxide is heated in a furnace with hydrogen. The hydrogen reduces the oxide (removes its oxygen atoms) leaving pure tungsten metal, which can then be worked and shaped (pressed, hammered, or pulled) into bars, wires, or whatever form is needed. 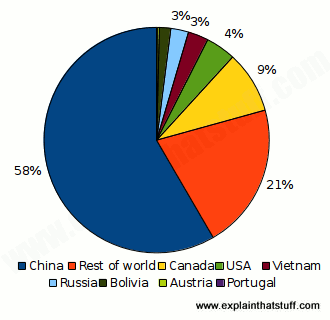 Chart: Where does the United States get its tungsten from? Since 2010, there's been a reduction in the dependency on imports from China. Inner ring (white labels): 2010–2013; Middle ring (green labels): 2012–2015; Outer ring (black labels): 2013–2016. Source: U.S. Geological Survey, Mineral Commodity Summaries: Tungsten, January 2016/2017/2018. Much of the world's tungsten is currently bought and sold in the form of a convenient, white powder called ammonium paratungstate, a complex chemical salt of ammonium and tungsten with the formula (NH4)10(H2W12O42)·4H2O. It's easy to transport and easy to convert into all kinds of tungsten-based materials. In 2017, 10kg (confusingly, also known as 1 metric ton unit or 1MTU) of APT powder cost around $250 in the United States; in 2018, the price has continued to climb to around $300–400. Most of the world's tungsten comes from China, though other countries have become increasingly significant suppliers since 2010. Other important producers of tungsten ore include Vietnam (which became the world's second biggest producer in 2014), Russia, the United States, and Bolivia. Canada, once a leading producer, suspended operations in 2015. Between 2010 and 2013, the United States imported roughly 43 percent of its tungsten from China, 8 percent from Bolivia, 6 percent from Canada, 5 percent from Germany, and 38 percent from the rest of the world; between 2013 and 2016, the breakdown of imports shifted to 34 percent from China, 10 percent from Canada, 9 percent from Bolivia, 8 percent from Germany, and 39 percent from the rest of the world. 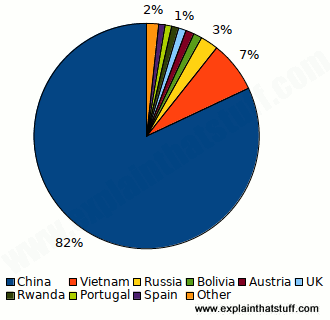 Chart: World of tungsten: Which countries have and produce the most tungsten? 1) World tungsten reserves: China has over half of all world resources and reserves and some of the largest deposits (concentrated in single areas). 2) World mine production: China produces over 80 percent of the world's tungsten. Source: U.S. Geological Survey, Mineral Commodity Summaries: Tungsten, January 2016/2017/2018. Pure tungsten metal is grayish or silvery-white, extremely hard (roughly similar to hardened steel), extremely strong, and brittle. It's much more impressive at high temperatures: it becomes ductile (easy to pull into wires), has the highest melting point of any metal, expands less than any other metal when heated, and has the greatest tensile strength of any metal at high temperatures. In its commonest form, it has a crystalline structure with its atoms arranged in the body-centered cubic (BCC) pattern (one atom in the center of the cube and others positioned at the corners). Photo: Tungsten carbide is widely used in cutting and drilling tools. About 60 percent of the tungsten consumed in the United States finds its way into carbide tools. Tungsten is reasonably unreactive (inert). It doesn't dissolve in water or alcohol, for example, and forms relatively few interesting compounds. Tungsten carbide (tungsten bonded to carbon, chemical formula WC) is by far the most important tungsten compound. With a Mohs hardness value of 9.5, it's almost as hard as diamond (and significantly harder than pure tungsten). Photo: Hot stuff! You need incredibly high temperatures to melt metals and weld them together, so the welding tool itself needs to be made of a metal such as tungsten that can withstand even higher temperatures. 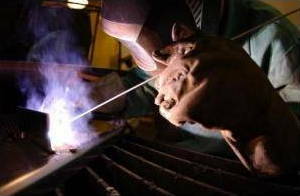 Here, a US Air Force engineer is welding two pieces of aluminum together using gas tungsten arc welding (GTAW) equipment, also known as a tungsten inert gas (TIG) welder. Photo by Jonathan Snyder courtesy of US Air Force. Its physical and chemical properties make tungsten useful in two particular areas: 1) very hard tools and 2) components and materials that can survive high temperatures. Tungsten carbide is widely used as a coating for cutting tools such as saws, drill bits, and jackhammers. Tungsten metal is also used in a similar way to make strong tool steels and tungsten-steel alloys that are important in airplane and rocket components. 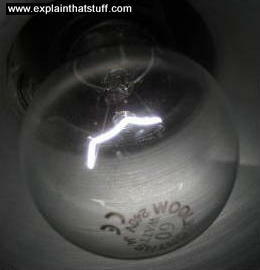 As we've already discovered, tungsten has long been used to make the glowing filaments in incandescent electric lamps. It's also used in old-style cathode-ray tube televisions (the hot elements that generate the electron beams are pumped out by a tungsten element). There are many other, less well-known uses for tungsten include the manufacture of paints, dyes, pigments, and phosphors (chemicals that give off visible light when they're stimulated with energy of some other kind); as a replacement for lead in fishing shot and bullets; and as an ingredient in lubricants, rust-resistant coatings, and fire-resistant compounds. Military uses include making radiation shields and heavy-metal alloys for various kinds of armaments. 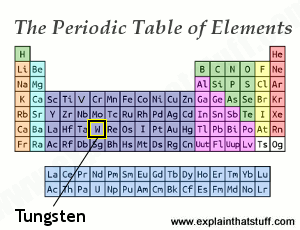 Artwork: The periodic table of chemical elements showing where tungsten (element 74, symbol W) lives. As you can see from its high atomic number (and low position in the table), it's a heavy element (and it's also very hard)—which is largely why it's used in things like drill bits, as well as bullets and missiles. Atomic number: 74 (one tungsten atom contains 74 protons, 74 electrons, and 106–112 neutrons, depending on the isotope). Isotopes: There are five stable isotopes: tungsten-180 (relatively uncommon), tungsten-182, tungsten-183, tungsten-184 (the most common), and tungsten-186. Discovered in 1781 by Swedish chemist Carl Wilhelm Scheele. First isolated in 1783 by Spanish chemist and mineralogist brothers Juan Jose D'Elhuyar and Fausto D'Elhuyar. USGS Minerals: Tungsten Statistics and Information: Detailed and definitive information about world tungsten production and trends. Tungsten Carbides: Structure, Properties and Application in Hardmetals by Alexey S. Kurlov and Aleksandr I. Gusev. Springer, 2013. A detailed guide to the world of hard tungsten carbides, their properties, and uses for metallurgists and materials scientists. Tungsten: Properties, Chemistry, Technology of the Element, Alloys, and Chemical Compounds by Erik Lassner and Wolf-Dieter Schubert. Springer, 1999. Probably the most comprehensive recent book about tungsten chemistry. Tungsten by Kerry Turrell. Benchmark Books, 2004. A basic introduction (32 pages) covering the chemistry of tungsten and its everyday uses. Ages 9–12. Tungsten by Nigel Saunders. Heinemann, 2003. A slightly longer volume, also best for ages 9–12. New Materials Could Usher in Faster-Charging, Higher-Power Batteries by Charles Q. Choi. IEEE Spectrum, 30 July 2018. New alloys of niobium and tungsten (Nb16W5O55 and Nb18W16O93) could greatly improve the performance of rechargeable batteries. Work starts on £130m Devon tungsten mine by Neil Gallacher, BBC News, 9 June 2014. The world's fourth largest tungsten deposit is home to a brand new mine in Devon, England. Tungsten Diselenide Is New 2-D Optoelectronic Wonder Material by Dexter Johnson. IEEE Spectrum, March 11, 2014. A new tungsten compound has promising properties that could revolutionize LEDs and solar cells. Tungsten: The perfect metal for bullets and missiles by Justin Rowlatt, BBC News, 12 July 2014. Why is dense and heavy tungsten so useful for making weapons?